"...the very pineapple of politeness!" As a lady who likes nothing more than a night at the theatre, I love a little Sheridan. The man behind such works as The School for Scandal, The Rivals and The Critic was as colourful as his plays, a wit and raconteur whose plays are still enjoyed nearly two centuries after his death. The son of parents who were steeped in both the arts and academia, Sheridan was not a man who shied away from scandal and when I was a young Gilflurt in 1772 I recall him fighting a fearsome duel right here on Henrietta Street. At the Castle Tavern, not three doors from where I host my weekly salons, Sheridan and Captain Thomas Mathews fought over the honour of Elizabeth Linley, Sheridan's intended bride and daughter of Richard Linley. The duel went onto a second round in Bath and Sheridan was almost killed but the lady's name was defended and our playwright made a miracle recovery! 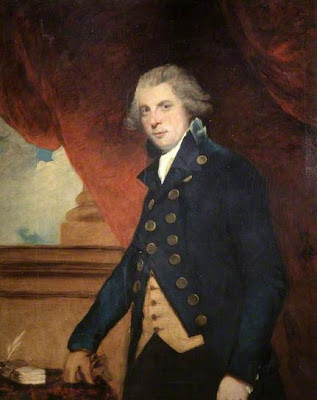 He and Elizabeth were wed, returning to London to live the high life on her dowry until, in 1775, Sheridan's play, The Rivals, made him an overnight star. By 1778 he owned the controlling stake in the Drury Lane Theatre and he used it as a base for productions of the plays that followed, enjoying enormous success. Sheridan wasn't satisfied with life as a theatrical luminary and embarked on a second career as a Whig Member of Parliament. Noted for his powerful speeches and witty ad-libs in the House, he eventually served as Treasurer of the Navy and would remain a radical figure in Parliament for 32 years, serving three different constituencies until he finally lost his seat in 1812. Three years previously his theatre had burned down and, already financially stretched by this disaster, things became progressively worse for our hero. As a girl who keeps a tight hand on her purse string I've never got myself into money trouble but Sheridan wasn't quite so lucky. He liked the high life and it came at a price and though Congress offered him £20,000 to thank him for his political efforts to avert the War of Independence whilst in office, he proudly turned down the money and sank further and further into debt. Sheridan died in poverty in 1816, leaving behind a body of work that has rightly seen him celebrated as one of the greatest names of English drama. His internment in Poets' Corner at Westminster Abbey was attended by some of the grandest figures in the country and his coffin was borne to its final rest by the Lord Bishop of London and Earl Spencer, amongst other illustrious names. Two hundred years after his death, theatres worldwide still ring to the sounds of Mrs Malaprop and Lady Sneerwell, the comedy as timeless as the name of the man who created it. That would depend on the book, sir! I had an office in Covent Garden for years. I recall the tale, as no doubt you do, Madam, of his comment when quizzed whilst sitting in a pub drinking wine as he watched his theatre being burnt to the ground. "Cannot a man have a drink by his own fireside?" Dr. Johnson launched one of his better insults at Sheridan: "Why, Sir, Sherry is dull, naturally dull. Such an excess of stupidity is not in nature." A bit wide of the mark when you think of those glorious plays. Johnson was *very* wide of the mark in my opinion too; Sheridan is an absolute favourite of mine and one of the first Georgians to pique my interest in my younger years. I do indeed recall the tale and that sad evening enjoyed a post all of its own on the blog, you can find it at http://www.madamegilflurt.com/2014/02/on-this-day-fire-at-theatre-royal-drury.html . It is said,Madame that the Prince of Wales-on his way down to Brighton espied the impoverished Sheridan disappearing down a sideway.Oh look-there's Sheridan,he said and travelled on completelyignoring the friend he had known for over 30 years! What a charming chap Prinny could be!